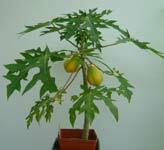 An interesting plant with big serrated leaves, believed to have many medicinal uses. 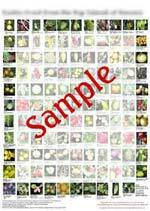 Fruits are yellow-orange, sweet and fragrant..
Packet of 20 seeds - $1.00 each. In tropical countries, trees start to bear flowers at 9 months from seed. Copyright © floraexotica.ca. Last Updated 07-Feb-2007.